Roses are like the ponies of the rose world; smaller but just as beautiful if not more lovable. 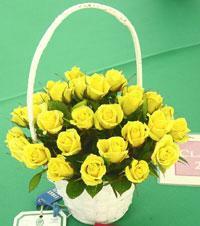 Considered "cute" roses, this large arrangement comes with 24 yellow roses. Placed into a large basket and blended with assorted greenery, this combination makes for the perfect gift on anniversaries or as a friendship gift.